Sr. Kathryn was born in Plymouth, Devon, England and immigrated to Canada in 1968 with her mother and siblings. They settled initially in Vancouver, and then moved throughout the Province over the course of a number of years, living in Smithers, Dawson Creek, Kelowna and finally Victoria. Subsequent moves included Nova Scotia and Ontario but Kathryn and her Mother returned to BC in 1993, settling first in Abbotsford. During her working career in a variety of professional offices, she had been studying for and obtaining an Accounting Diploma with CMA. Later, they moved back to Vancouver Island where Kathryn established an accounting business for herself, and was able to work primarily from home and be of support to her Mother whose health began to fail in 2004 until her death in 2009. The care of her Mother over that five-year period left Sr. Kathryn both physically and mentally exhausted, and wondering what life would hold in store for her now. While study of all religions was encouraged in her upbringing, attending church was not. 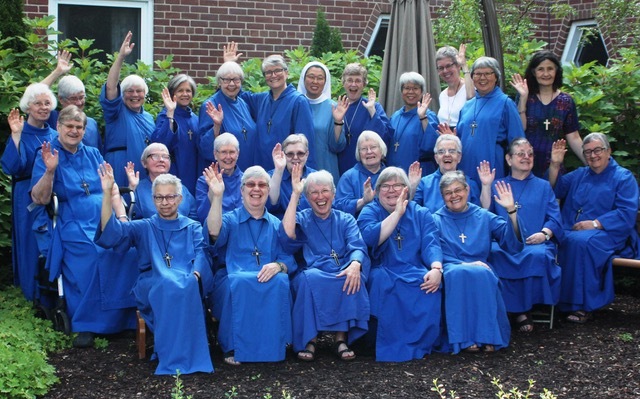 Kathryn felt a call to the religious life at age 16, particularly to a religious nursing order – the Sisters of St. Ann in Victoria. Circumstances did not allow her to entertain this option at the time. Following the death of her Mother, Kathryn attended St. Mark’s Anglican Church in Qualicum Beach and was welcomed with open arms. She focused on her healing, and was baptized and confirmed in January 2010. She became involved in Cursillo in 2011, graduated the EFM program in 2014, and became a mentor that supported her work in various church ministries. After hearing about a Rosary workshop at BC House she visited the house and sensed it was a spiritual home in which she could anchor her faith journey. In 2012, Kathryn became an Associate, but later, in the silence and contemplation, she sensed it was “not enough”. She began Oblate discernment and took first promises in November 2014, but again the guiding voice said “not enough”. 2015 was a particularly challenging year with her work in a local law firm and in finding ongoing support for her spiritual growth. During a residency week at BC House, she sensed again the need for transformation and to discover a way to live each moment “from that true place” within herself with deeper integrity and intention. 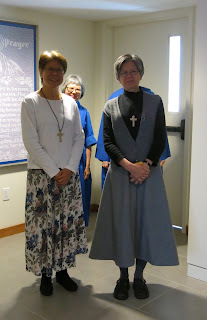 She responded to that call by applying to the Convent to enter as a postulant. From that point, things moved very quickly and Kathryn entered community on the first of April 2016. Highlights for Sr. Kathryn are the structured commitment to prayer and devotion throughout each day, support in her spiritual formation and the opportunity to serve community in so many ways, all in a place of true peace and Godly love.